2013-05-31 - A turquoise background studded with myriad multicoloured position markers overlaid on a map of the streets of Brussels; the route of the Canal crossing the poster from side to side; the outline of the Canal Area; and bearing the slogans “Exercising-Breathing” and “Going Out”: for the past few days, refreshing visuals have appeared in the central Brussels municipalities through which the Canal Area runs. Over the next few weeks, table sets will brighten up the restaurants there, postcards will grace the racks in cultural venues and posters will multiply in public spaces. 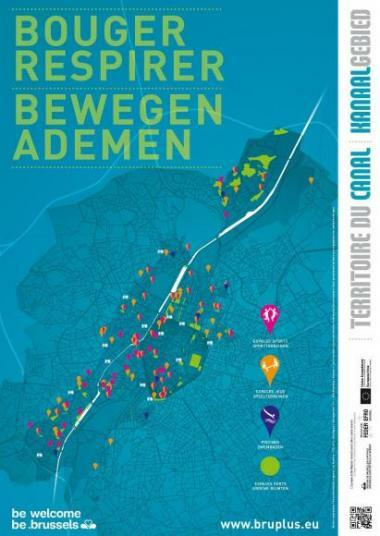 The Urban Development Agency (ADT-ATO), which is organising the operation, has received support from STIB-MIVB, several municipalities (Anderlecht, Brussels, Forest, Molenbeek, Saint-Gilles and Saint-Josse) and Atrium for the display and distribution of the visuals, and from Brussels Environment for the cartography. The goal of ADT-ATO is to make people more aware of what the Canal Area has to offer: its diversity, dynamism, activities, events, heritage, facilities, green and leisure spaces, cultural venues … in short, all the points of interest, some of them little known, in this territory of strategic importance for the development of the Brussels Region. ADT-ATO plans to modulate the themes and colours to reflect the changing seasons, with a first visual presenting places of interest on each occasion and a second listing the events of the three-month period, both local and regional. For this first instalment of the four already planned (June 2013, October 2013, January 2014 and April 2014), in addition to this ‘geolocalised calendar’ entitled “Sortir/Uitgaan” (“Going Out”: see here), ADT-ATO will present the green spaces, swimming pools, outdoors sports areas and playgrounds under the title “Bouger-Respirer/Bewegen-Ademen” (“Exercising-Breathing”: see below). Click also here (IBGE link) to find the precise geolocation of these places.